There’s nothing more frustrating when it comes to cover art than inter-linking covers that don’t quite ‘inter-link’. Or maybe I’m just too damn fussy and need to not sweat the small stuff and see the bigger picture. 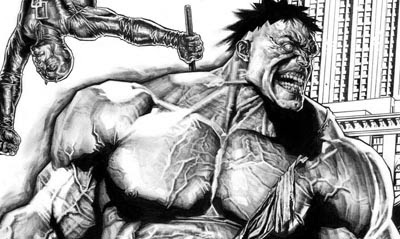 Luckily over at Lee Bermejo’s Bruises and Black Eyes the superstar artist has been releasing a daily piece of a giant Marvel spread, that whatdayaknow, actually does link up. With all the impact of a rivet gun, this chunk of awesome was Lee’s first ever crack at any Marvel characters! Right off the bat look how he nails guys like The Hulk and the Human Torch – Johnny actually looks like a man on fire! (Click to embiggen). Printed and commissioned by Panini Comics outside of the U.S, you can read all Lee’s insights into his thoughts and the challenges of each piece at Bruises and Black Eyes. What're you waiting for folks - jump! I love the Spiderwoman splash page to the left too. Where's that located? The Hulk looks crazy cool like he was from 28 Days Later or something. I know right guys? Awesome from start to finish. I don't think I've ever seen veins drawn into a chest like that before but man does it suit the Hulkster! Craig that Tronned up Spider-Woman is the variant cover to Avengers #7 - hopefully one that's easier to find up there than it is down here! Wow. That's just amazing. I love how Gambit looks a little bit like Dennis Quaid from The Big Easy. Way to nail it. Now that you mention it Random I can see that too! On his site Lee says he wishes the line up had allowed him to add Havok and Iceman. As a fan of coathanger head having Havok in the image would just have put it over the top! Who is the one guy you folk would add? Nightcrawler. No contest. It needs a little Bampf. You're right Random - Nightcrawler would dust it off just right! I would've also liked to have seen a page with an Avenger or two - even if it was just Scarlet Witch and The Vision! I'd love to see his take on Beast. I think ol' buckethead and Cap should be in there too. But Beast is my pick. Random, Nightcrawler was always one of my wife's favorites too. Random, Craig's wife has great taste in super-heroes! There's just something about the fuzzy ones, isn't there? :D I gotta admit, next to Nightcrawler, I'd like to see the Beast in there next.